Yehuda Amichai is Israel’s most popular poet as well as a literary figure of international reputation. 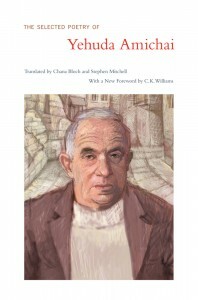 Renowned translators Chana Bloch and Stephen Mitchell have selected Amichai’s most beloved and enduring poems from his eleven volumes and have included forty new poems from his recent work in this revised and expanded collection. God peers into the universe. while one of them seeks. and scattered like blossoming in springtime. at side entrances, with many heartbeats. dust rises in many myriads of grains. and inside, voices talked of future war. through two points only one straight line can pass. A stray dog chased us down an empty street. I threw a stone; the dog would not retreat. The king of Babel stooped to eating grass. as locomotive-power can pull long trains. When will we step inside the looking-glass? our life eternal to a life of years. Our life of gold became a life of brass. those peacocks and ivory boxes. were lit up in red. a ship without a subconscious. to the cool lands of the North. was already a zebra of moods, good and bad. night-lizards left their footprints on her belly. her secrets were embroidered on scarves. and over the whole world. in the foreign language of fish. from above and below, like the queen of spades. as a violin’s form is the form of its case. and the sharp tearing of paper. so that her words would drown in it. of her hair, for him to be lost in. were spread, face up, on the table. lay scattered out of their boxes. in the trash of thinking. miracles were locked in their cages. Chess horses were led back to the stable. Later, in ponderous parade, the King’s soldiers arrived. as on Yom Kippur eve. no sound, departed and departed and departed. Yes, certainly that is true. It is exactly as you have said. In me—love, dark and flowing. for the terrible Days of Awe. before the rules are discovered. before we have nowhere to stand. How can a man be mayor of such a city? What can he do with it? Build and build and build. who have become the slaves of men. For sheer energy of imagination, for the constantly renewed sense of poetry’s ability to engage reality, Amichai has no close competitors on the Israeli scene, and perhaps only a few worldwide. The book emphasizes, as none of the others have, Amichai’s range — that he’s a love poet, a war poet, a citizen, and a historian, and not just on different days, but all at the same time. Yehuda Amichai is by now one of the half-dozen leading poets in the world. He has found a voice that speaks across cultural boundaries and a vision so sure that he can make the conflicts of the citizen soldier in modern Israel stand for those of humankind. His wit is considerable: he can say virtually anything and give his words enough sting to defuse both sentimentality and hyperbole. Yehuda Amichai is that rarest of modern writers, an ironist beyond irony. After all the delicate craftsmanship of his poems there remains a kind of manful literalness, a stubborn belief in the saving power of directness…. Here is writing that is fully the match for its onerous occasions. And as thelucky readers of this collection will learn, Amichai’s famous “spoken” language is spoken by nobody but Amichai. Yehuda Amichai’s splendid poems, refined and cast in the desperate foundries of the Middle East, where life and faith are always at stake, exhibit a majestic and Biblical range of the topography of the soul…. He is a psalmist utterly modern, yet movingly traditional.